A Citation X aircraft built by Cessna that features elliptical winglets developed by Wichita-based Winglet Technology made its maiden flight this week, collecting data to support Winglet Technology’s effort to obtain FAA and EASA supplemental type certificates (STC’s) for its patented winglet design. ‘Winglets will improve the range and payload on hot days or at airports with high altitudes’, said Fort Felker, Winglet Technology’s vice president for engineering. ‘It will allow the plane to hold more weight – passengers, baggage or fuel – on those flights. Frequently, you can’t take off with as much weight as you’d like on a hot day, and the winglets make a big difference,’ Felker added. Cessna announced in March that it had joined with Wichita-based Winglet Technology to evaluate Citation applications for the elliptical winglet. 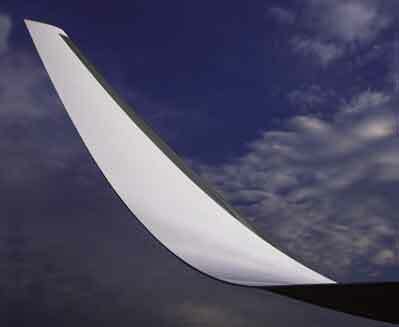 The unique elliptical winglet, an upturned extension that fits on the tip of the wing, will be tested for use as a retrofit on Citation X jets. Fort Felker, who holds the patent for the winglet design, started Winglet Technology in 2001 with president Bob Kiser. A year later, it secured a $150,000 grant from Kansas Technology Enterprise, which led to the Citation X winglet program. The use of winglets is growing in popularity. The first production aircraft to use them was the Learjet 28/29, built in Wichita in 1977. Last year, Airbus SAS tested two types of winglets – one of its own and one of Winglet Technology’s – on its single-aisle A320 aircraft. Ultimately, Airbus decided against the use of winglets, saying the weight of the modifications would negate any aerodynamic benefits. Kiser disagrees. ‘We believe that our elliptical winglet design provides a very significant improvement for the aircraft,’ said Kiser, a Wichita native who spent almost 20 years at Boeing’s modification centre in Wichita.